I guess looking back now, I feel that God has always had a plan for my life. I was born with medical challenges that kept me confined mostly to the house. However, I never felt that I was missing out on anything. My memories seem to be the same as those of my siblings: playing in the woods, riding bikes, or just simply playing with neighbor children. My mother was a devout Catholic, and she made sure that we were trained and served in the Catholic Church. As I got older, I drifted away from the church for reasons I didn’t know at the time. As a young man, I was able to do the things that interested me. I never really thought about death and dying; I suppose it was something I knew was possible, but I never dwelled on it. I went on into adulthood and got married. My parents moved away for a while, and it wasn’t until they moved back to the area that I started going back to the Catholic Church. Later, my father died and my mother came to live with my wife and me. For her, as a devoted Catholic, church was her life. Taking her to church every Sunday gave me a yearning for the truth. I would listen to the readings and the sermons, and they sparked many questions. That is when my search and thirst for God’s knowledge began. We moved to the Collegeville area and had to find a church for my mother as well as one for my wife, who was not Catholic. Going to church on Sundays was like going to work. I attended two different churches. I would take my mother to the Catholic Church and then take my wife church hunting. My wife was looking for a place where the Word was preached with praise and worship. I was looking for a place where she felt accepted and safe. Valley Forge Baptist was the church that suited us. The people were very welcoming, warm, and friendly. The first time we attended, a man greeted us, and I shared that I was a Catholic. His reply was, “Oh! You are going to be comfortable here. There is a bunch of Catholics sitting down in the front rows!” He was delightful and funny. As I sat under the Word being preached each Sunday, I began to understand that I was not truly a “born-again Christian.” I began listening to other evangelists on the radio on my way to and from work. I began reading the Word of God and pondering over things that I heard on the radio, on television, and at church. Pastor Wendal’s sermons brought clarity to many of my unanswered questions. One Sunday, I was convicted of my sins, and I said the sinner’s prayer and received Jesus Christ as my personal Lord and Savior. I am now walking with the Lord as my search for His purpose for my life continues. 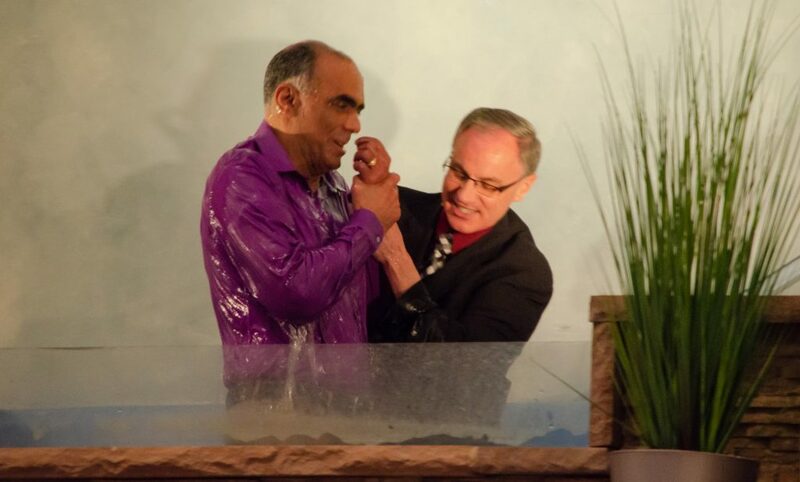 I recently followed the Lord in obedience to His command to be baptized after I became a genuine Christian. I give all praise to the Lord for drawing me to himself. Tony and his wife are members of Valley Forge Baptist in Collegeville, Pa.
Community Connection is an outreach magazine and blog from Valley Forge Baptist to provide relevant and uplifting articles for the families and homes of Collegeville, PA and area residents. Articles are not just from staff but from other community members who’s lives have been touched by Jesus Christ. If we have been an encouragement to you please let us know at info@vfbt.org.